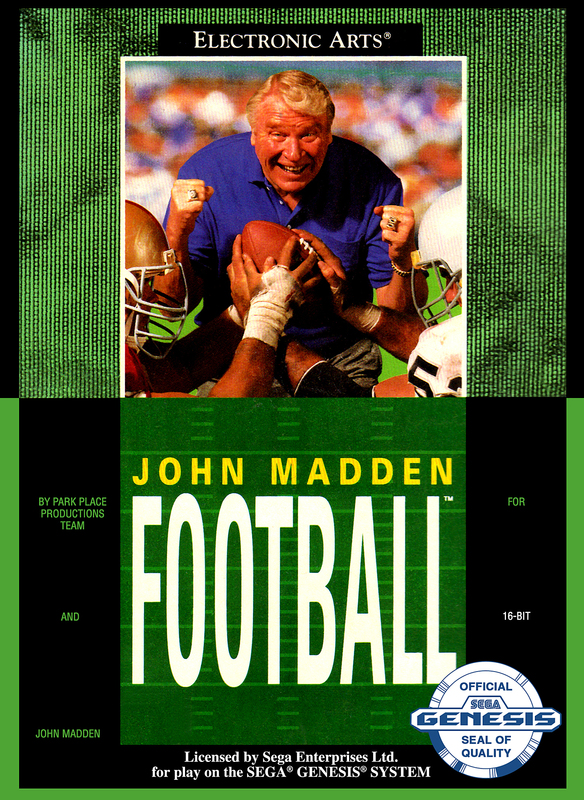 By now, the history of John Madden Football is well known. 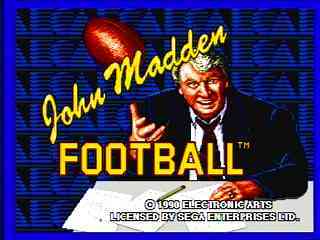 One can search Google and stumble upon dozens of articles about the genesis of the Madden franchise, but what these articles fail to give you however is a glimpse at how huge the birth of John Madden Football really was for people who experienced it first hand. So instead of doing another “wikified” version of Madden’s origins, I’m going to tell the personal story of my introduction to the storied franchise. It all began back in 1989, when I was in a Walden Books at the Grossmont Shopping Center in San Diego, CA. While there, I spotted a video game magazine called “GamePro”. At that time I had never read a video game magazine and in fact didn’t even know that they existed. For some reason I decided to pick this magazine up and browse through it. During this part of my gaming life I was the owner of a NES system and was much more of a casual sports gamer than anything else. My favorite games were things like Double Dribble, Bases Loaded, and Tecmo Bowl. I wasn’t into non-sports games as I was much more of the casual sports gamer. As such, when I was browsing through Gamepro I was really only looking for info and pics on new sports games for the NES, but I noticed that there was quite a bit of coverage on two new gaming systems that were about to hit the US; the TurboGrafx-16 and the Sega Genesis. I had no idea that two new gaming systems were on the horizon, so I continued looking through the magazine and I discovered a number of pictures of a new sports gaming lineup for the TurboGrafx-16 system. It was the football game that really caught my eye. It was called TV Sports Football, and I was totally amazed at how large the player in the picture was that was kicking the field goal. It was at that moment that I decided to sell all of my NES stuff (a decision I later regretted), and put the money towards a TurboGrafx-16 system with the idea that TV Sports Football would be the pinnacle of football gaming. Unfortunately, things didn’t exactly turn out the way I had hoped in regards to not only TV Sports Football, but sports gaming in general on the Turbo. I waited for what seemed like eons before TV Sports Football was finally released on the TurboGrafx-16. The game was continually delayed. I remember finally buying the game at Toys R US and racing back to my buddy’s house to fire it up. We had the TurboTap (a four-player adapter) and all of our TurboPads ready. When we first started playing TV Sports football we were amazed by it. It actually allowed 4 people to play at a time so we played a lot of 2 on 2 matches. We even started a league and kept our standings and stats on notebook paper. Everything seemed right in the world of sports gaming for me because my choice in the TurboGrafx-16 system was finally justified – or at least it seemed that way. I had also purchased a Sega Genesis, but the only game that we really played on that system was Pat Riley Basketball which was a rather lackluster basketball effort. A few weeks went by, and then one day I came home from work and went straight to my friend’s house expecting to begin another lengthy session of TV Sports Football. When I got there, I was in for a very rude awakening. My three best friends couldn’t contain their excitement. They told me that one of our other buddies had been over earlier in the day and had brought over a new Sega Genesis game called John Madden Football. They said it was the most amazing football game they had ever seen. Wait a minute… I was finally able to buy TV Sports Football just a couple of weeks prior; I had finally justified my purchase of the TG-16 system, and now there was a new football game on the Genesis that made TV Sports look like an Atari 2600 game? Crestfallen, I was both depressed and somewhat intrigued at the same time. On one hand, my validation of the TG-16 had just been flushed down the toilet, but on the other hand if this game really was blowing TV Sports Football out the water then it must be absolutely spectacular. After thinking the matter over for about a half an hour, I ran down to the nearest Babbages and asked them about this new football game for the Genesis. The salesperson handed me John Madden Football and said that they had just gotten it in the day before. I raced back to my friend’s house and popped the game in my Genesis. It took only a few seconds for all my disappointment about the fact that TV Sports Football, a game that I had been waiting forever for, was eclipsed in a matter of weeks by a game I had never heard of. Pure bliss washed over me as I was transported into a world of video football the likes of which I had never seen. 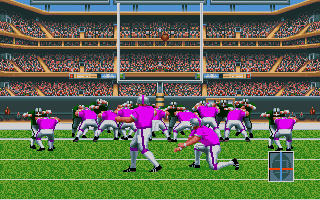 Right at the beginning of the first game I played, the kicker kicked the ball off to start the game and I saw the screen scroll in psuedo-3D fashion. I completely forgot that TV Sports Football even existed. Football had never been presented in this way before. The game seemed practically 3D in comparison to everything that I had played up to that point. I got to the play calling screen and had never seen such detailed play calling options. Instead of having just a few options for calling plays (like Tecmo Bowl), there were tons of options available. Different formations; everything a football fanatic could dream about. I called my first play, which turned out to be a passing play, and discovered that I had to hit the C button again to bring up my passing windows. “Absolutely Brilliant!”, I thought to myself at the time. When I first saw those passing windows pop up, I had the option of throwing the ball to 3 different receivers, and I could actually see them running their routes with the defensive backs in pursuit. Then I heard the amazing sound effects! This game wasn’t just a visual feast for football video game fans at the time; it had amazing audio as well. It truly was light years ahead of any football game that had come previously. For the readers out there who can’t understand what I mean because they have no interest in sports games or football, the experience was much like seeing Mario 64 for the very first time. You knew, right then and there, that platform games would never be the same. That a single game had changed the rules forever. That every single game that followed would have to adopt this new format or suffer greatly in comparison. It was exactly the same way with John Madden Football for the Sega Genesis. It was a watershed moment in sports gaming. My buddies and I played that first Madden game until the label had completely worn off the cartridge. We had so many tournaments and leagues, and I can’t begin to guess how much money was wagered back and forth. We used to have round robin tournaments, and the primary goal was to simply win the game so that you didn’t have to give up the controller and have to watch two other guys play. The playability of the game was truly remarkable. There had never been a football game that gave you that much control over the various football players running around on the field. 11 players on each side of the ball just like real football. In recent years, the mention of Madden has typically brought on negative thoughts among most gamers, myself included. It pains me to see what has happened to this once glorious franchise. But I’ll never forget that day in 1990, when my dreams were shattered upon hearing that TV Sports Football had been left in the dust, and then later in the day realizing that a new legend was born. It was a truly amazing time, both as a football nut, and as a video game nut. Tagged genesis, mega drive, Retrospective, sega. Bookmark the permalink.